On September 27, in a granite building that once housed a bank in Winsted, Connecticut, the American Museum of Tort Law opened for the first time. The occasion was also the first time attendees—or, frankly, anyone—ever heard the words “tort” and “museum” combined into one phrase. But for longtime consumer advocate and Winsted native Ralph Nader, it was the culmination of 17 years of work. The inspiration came in 1998, when Nader visited plaintiff’s lawyer William Trine in Boulder, Colorado, to look at some exhibits in a major case he had won. “What do trial lawyers do with key exhibits in such cases when they’re over?” Nader asked. “Well, they either store them in boxes or throw them out,” Trine replied. Light bulb! Nader began raising money to build a location that would not only store such files but also help advance the public’s understanding of torts and protect tort law from ongoing attacks. He was often disappointed by wealthy trial lawyers reluctant to share any of the profits from this process, but he was never deterred. Nader has watched with alarm as this amendment’s great premise has been undermined by a successful corporate campaign to translate tort law into “frivolous lawsuits,” the work of “greedy trial lawyers.” The Koch-funded lobbying group ALEC has spearheaded this propaganda effort along with the coordinated assault on state product-liability laws that has made filing and prevailing in such cases harder, if not impossible. The poster child of that crusade, and the subject of a major exhibit at the museum, is the infamous 1994 case in which 79-year-old Stella Liebeck, balancing a cup of McDonald’s coffee on her lap in a car, was hospitalized for third-degree burns over a sixth of her body. “Tort reform” lobbyists scoffed at Liebeck’s claims, but when it turned out that McDonald’s had, in fact, been warned for a decade that coffee heated to 180 degrees would scald people and that 700 customers had been so injured, a jury forced the company to pay her several hundred thousand dollars for her pain and suffering. Visitors entering the museum walk past a large quote from Judge Learned Hand: “Thou shalt not ration justice.” They also see an eye-catching, mint-condition red Corvair—with its (in)famous rear-end engine, which made it the centerpiece of Nader’s classic Unsafe at Any Speed 50 years ago—as well as the lathe that established strict liability for manufacturers who make dangerous products. A short film on the history of product liability is complemented by colorful illustrations of major moments in tort law, from the 13th century through Nader’s successful lawsuit against GM for “invasion of privacy.” (The company illegally investigated him before the famous auto-safety hearings that created the 1966 National Traffic and Motor Vehicle Safety Act.) Plans are now underway to build a model courtroom, take exhibits on the road, and make the museum not merely a destination but an “educational enterprise,” so the law of wrongful injury can stay strong and adapt to new situations (driverless cars?). At two convocations to mark the museum’s opening, some 500 guests listened to an illustrious panel of lawyers and public figures, including historian Eric Foner and Connecticut Senator Richard Blumenthal, share their insights on tort law and its crucial role as “the weapon of the weak.” Nader welcomed Chinese students, in Chinese, in the “hope that you go home to start a civil justice system back in China.” Guests also heard Nader pal Patti Smith perform “People Have the Power,” and then listened to Nader explain his mission for the museum. It’s heartening to see that the 81-year-old Nader, at an age when historical figures are usually writing memoirs and founding institutes, has not slackened in the least in his creativity or energy on behalf of consumers. 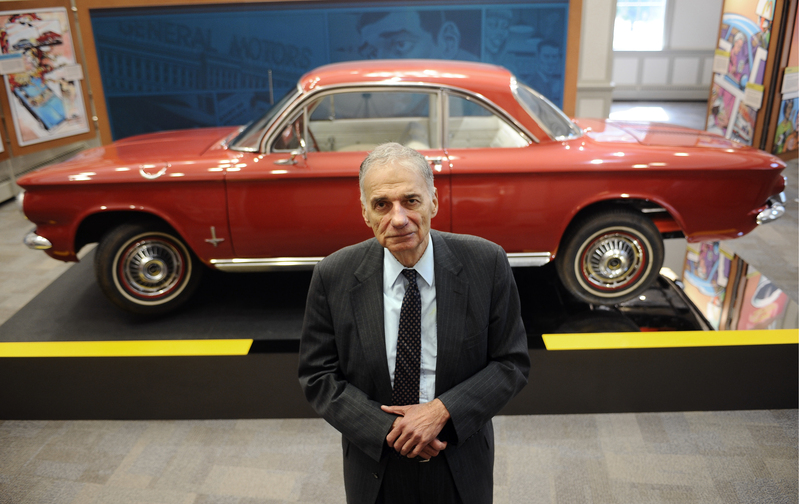 As for whether the museum will really be an effective way to challenge Big Business, sitting in the audience I was brought back to another David vs. Goliath battle 50 years ago, when most people questioned Nader’s crusade for an auto-safety law and his attack on General Motors, then the largest company in America. Now its Corvair is a museum piece.